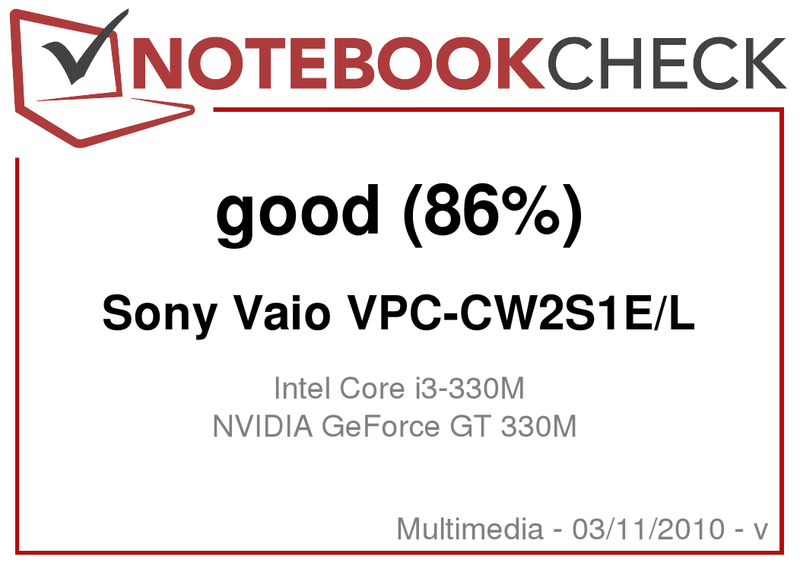 With the Vaio VPC-CW2S1E/L Sony brings a new 14-inch multimedia notebook to the table, featuring a 16:9 format screen and the performance of the Intel Core i3 or i5 processors in combination with Nvidia's GeForce GT 330M graphics chipset. Read on to find out how the newest member of Sony's CW-Series fared in our test report. 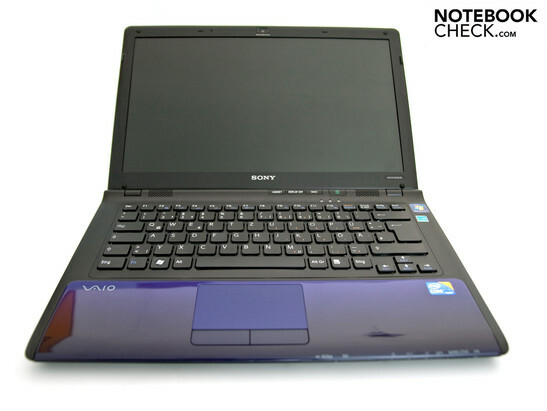 The end-user has the pick of the litter, as Sony is offering the CW-Series notebooks in seven different colors (black, white, blue, red, pink, yellow and light blue). 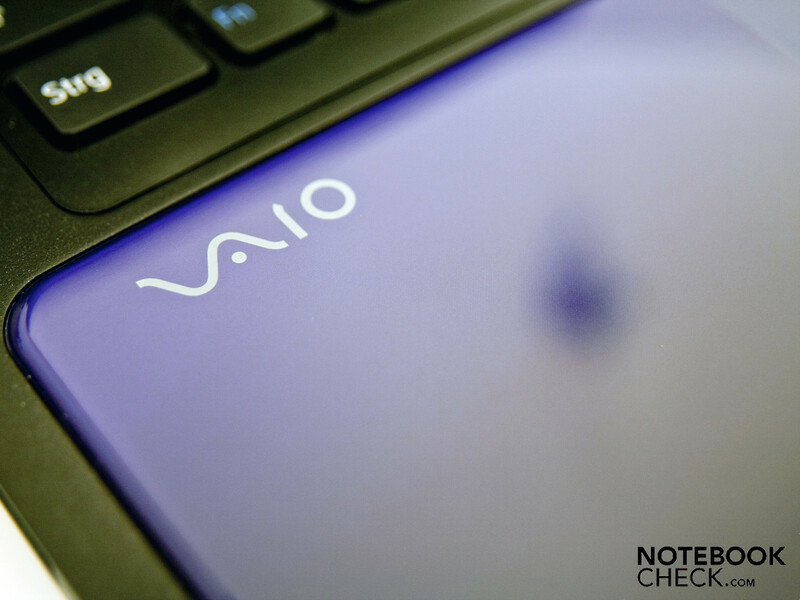 This new series is outfitted with the latest Intel processors and Nvidia GeForce graphics; ordering directly from the SonyStyle Online Store allows you to comfortably configure the Sony Vaio CW exactly how you would like. Two of the seven color variants are only available by ordering directly from Sony. Before moving along, here is some information about our test model (VPC-CW2S1E/L): an Intel Core i3-330M Processor clocked at 2,13 GHz, Nvidia GeForce GT 330M Graphics Card, 4GB of DDR3 RAM and a 320GB hard drive. This configuration is available direct from Sony for 829 Euro. 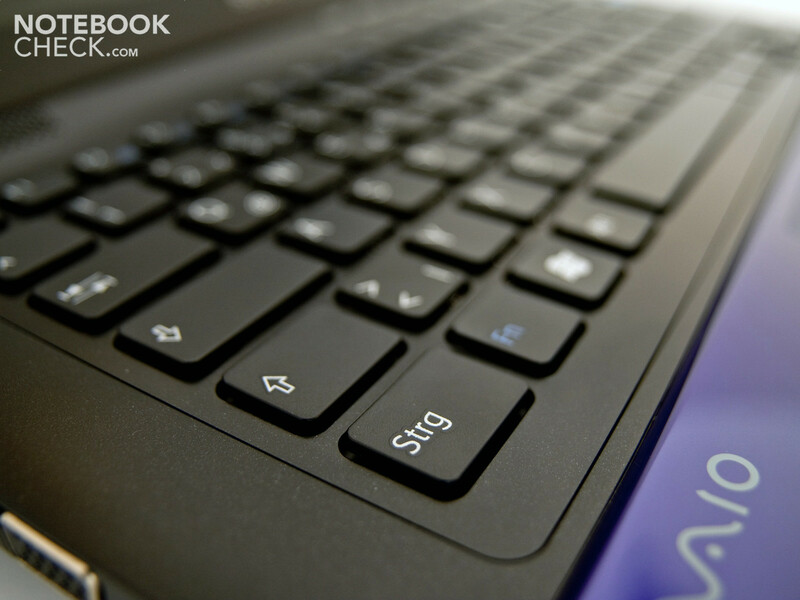 The most powerful model, costing 1239 Euro (MSRP), features an Intel Core i5-520M processor, 500GB hard drive, Blu-Ray burner and a high-resolution screen (1600x900 pixel). 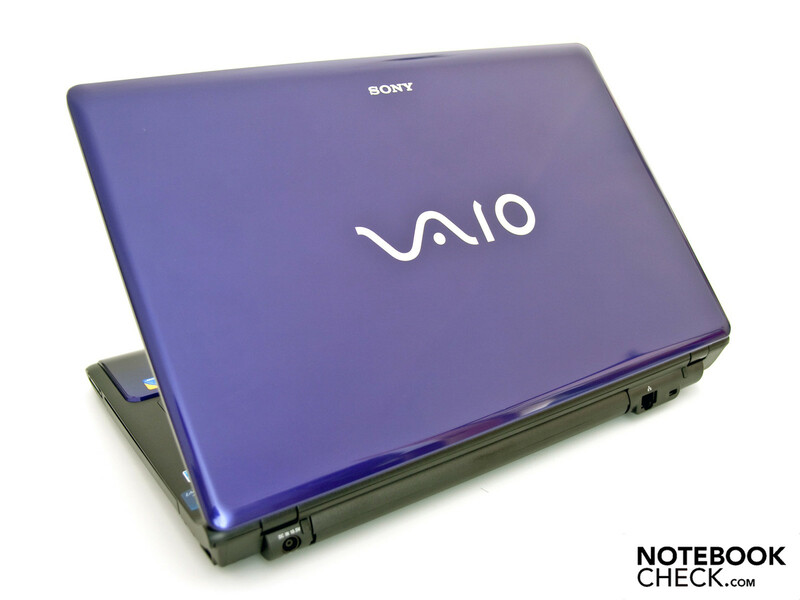 The Sony Vaio VPC-CW2S1E/L presents itself in a modern fashion with a blue casing; all of the available color variants are freely selectable and do not affect the overall cost of the notebook. The design is very effective due to the nice color combination of black and blue, looking very elegant and modern. The palm rest area is slightly raised and also in blue. 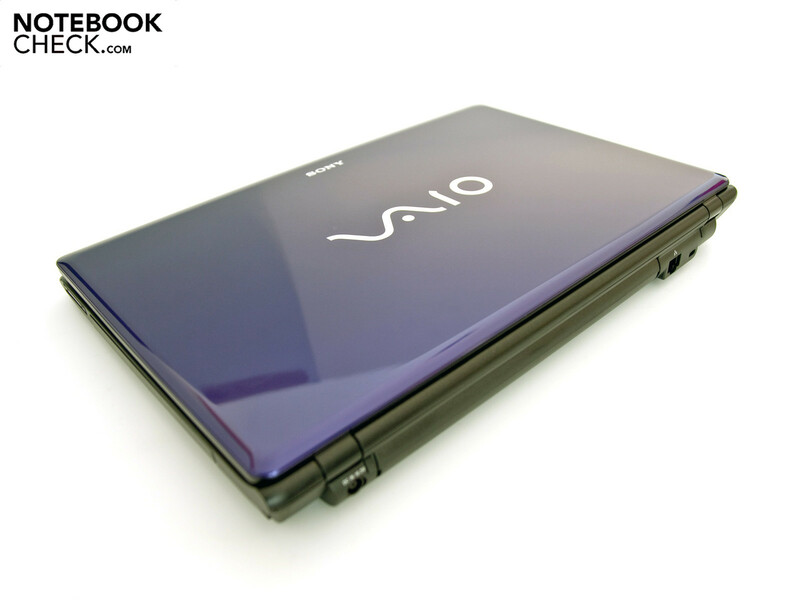 The large Vaio logo, finished in reflective chrome on the outer lid, fits well in the scope of the overall design. The finish of the casing is for the most part, excellent. The only noticeable weak areas were the palm rest area, where the design was not executed cleanly, leaving a sharp angle when viewed from the front. The high-gloss finish is very well applied, though it is vulnerable to dust, scratches and fingerprints. The stability under applied pressure is good and the case only yields under pressure that would exceed that experienced during normal use. With dimensions of 34.1 x 23.3 x 2.8-3.9 centimeters (W x L x H) our test system weighed on at 2.27 kilograms, where the included AC adapter adds another 410 grams to the scale. 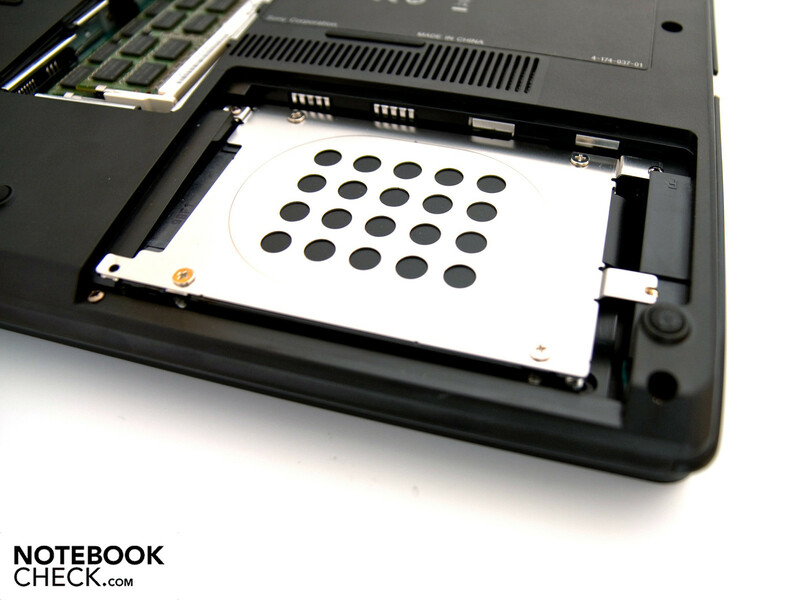 The weight lies within the normal ranges for a 14-inch multimedia subnotebook with such a hardware configuration. Owing to the 3.9 cm high construction of the rear of the device, the housing looks comparatively clunky. The underside of the device features two small maintenance covers. 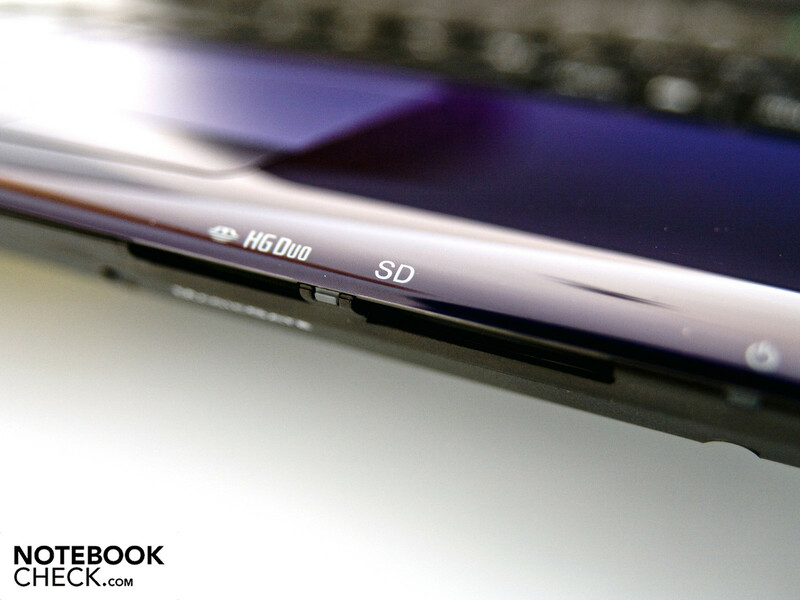 The first panel conceals the 320GB hard drive from Hitachi, though Sony offers the option of a 500GB model. 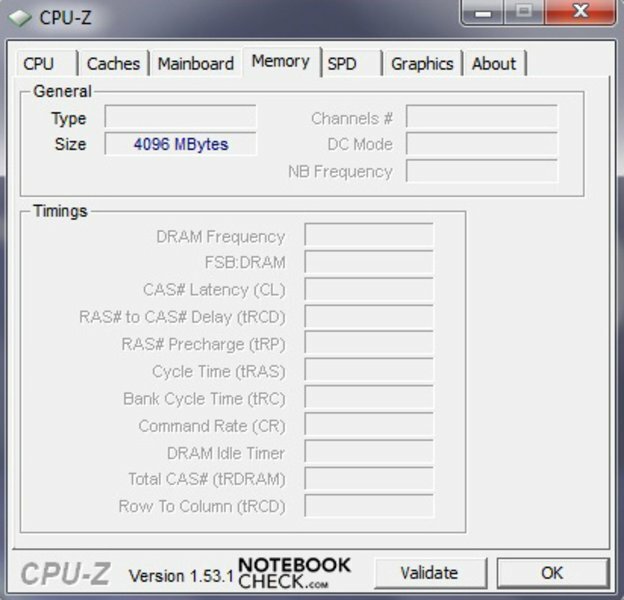 Access to the RAM is located under the second cover; while 4GB of DDR3-8500 is standard, a maximum of 8GB can be installed. The variety of connections available on the CW-Series is, for a multimedia device, very comprehensive and thus we found nothing to be lacking. 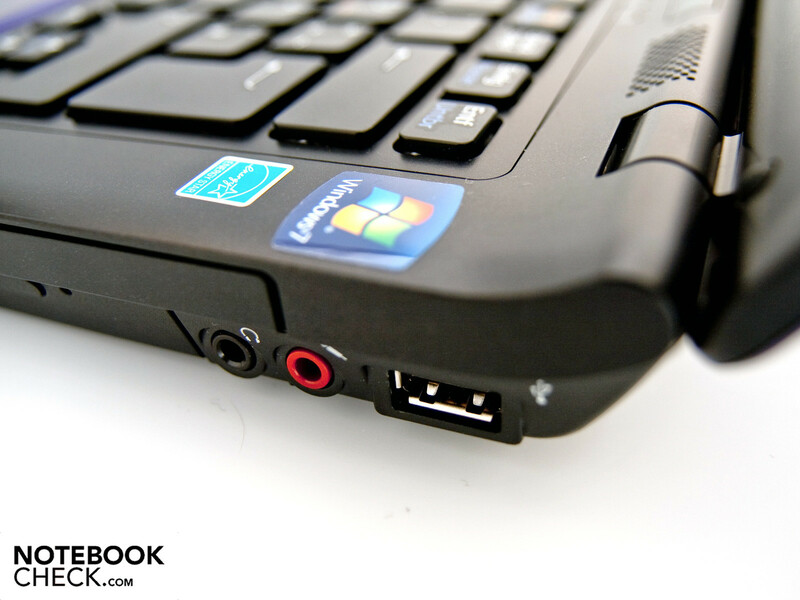 On the left side of the subnotebook there are two USB 2.0 ports, one FireWire 400 (4-pin), an analog video-out (VGA) and an HDMI-out, with which the user would be able to drive a modern television or monitor. 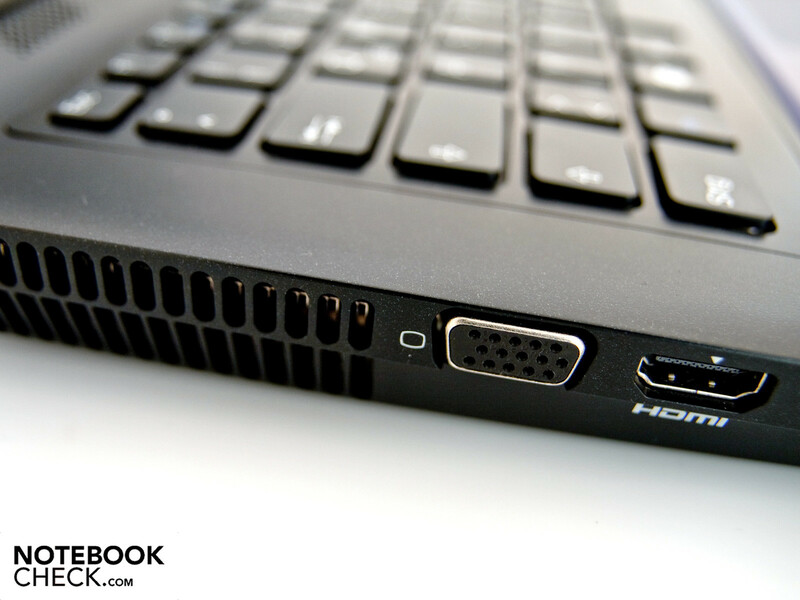 The advantage of HDMI lies in the ability to simultaneously transfer video and audio signals in high-quality. The connection supports HDMI specification 1.3. The newly-introduced specification 1.4 also supports Ethernet, which makes an additional network cable unnecessary. Opposite on the right side, there is a further USB port, two audio ports (headphone and microphone), a Multi-DVD Drive from Optiarc (DVD/RW AD-7700S) and an Express Card Slot 34, which enables the use of several pc expansion cards. Popular expansion cards include those for mobile TV-reception, additional storage space or UMTS accessibility. Sony integrated two card readers into the raised front, one of which services SD and SDHC formats and the other the proprietary Sony format. Next to the card readers are various status-LEDs and a hardware switch for the WLAN and Bluetooth mobile technologies. On the backside of the device is a gigabit RJ-45 network connection, a Kensington lock and the AC power connector. All in all, Sony did a great job with the layout of the ports, leaving little to be desired. Integration of faster FireWire 800 or USB 3.0 connections would only have increased the score we gave to the connectivity hardware. The connection to Ethernet networks is made possible through the RJ-45 network connection and the integrated Marvell Yukon 88E8057 PCI-E Gigabit Ethernet controller. For wireless networks at home or on the go, an Atheros AR9285 controller is provided, supporting WLAN 802.11b/g/n. For data synchronization with mobile devices such as smart phones, Bluetooth 2.1 + EDR is available. The CW2S1E/L comes with Windows 7 Home Premium 64-bit installed as standard. 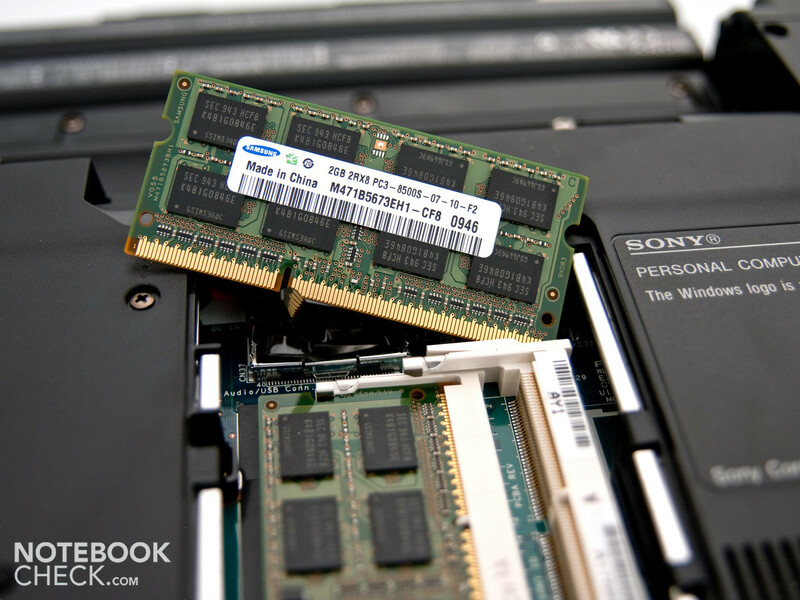 With this version, the 4GB of DDR3-8500 RAM can be completely addressed and efficiently used. 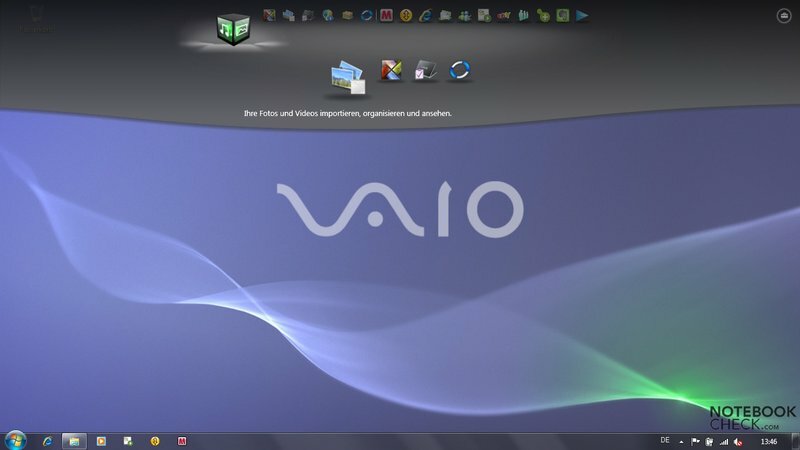 Aside from the operating system, Sony offers other more or less useful programs such as Adobe Reader 9, Microsoft Office Home and Student (60 day trial version), McAfee (60 day trial version), Norton Online BackUp trial version, Windows Live Essentials Suite, the Google Chrome Browser, Media Gallery, MusicStation, Vaio Gate and other Vaio-Software, such as the dock on the uppermost edge of the screen. Sony offers a multitude of various configurations by ordering direct from them. Our test device constitutes the basic configuration of the new CW-Series. 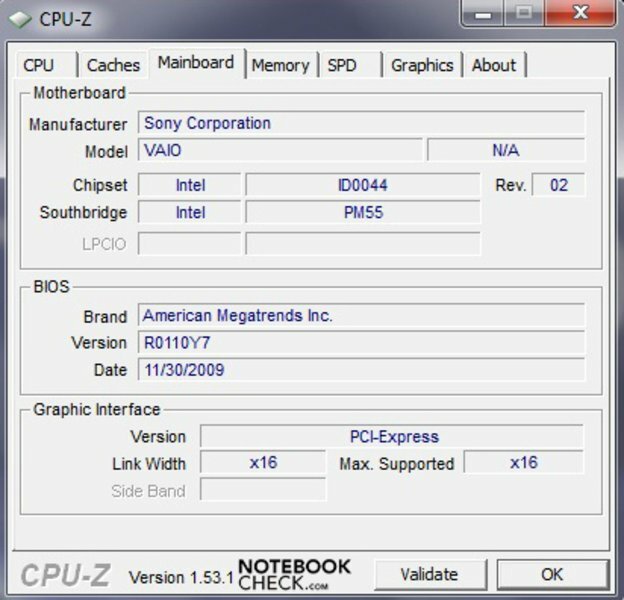 Sony alternatively offers two more powerful processors (i5-430M: +40 Euro, 520M + 70 Euro), a Blu-Ray drive and burner (an additional 50 or 100 Euro), 500GB hard drive (+40 Euro), Windows 7 Professional (+50 Euro), a high-resolution monitor (1600 x 900 pixels, +110 Euro) as well as various software packages. Packaged equipment only covers that which is absolutely necessary. 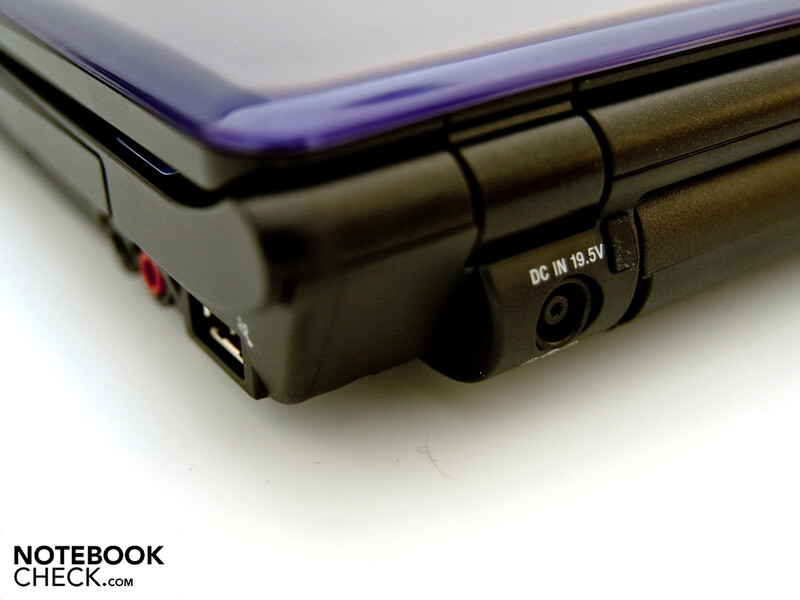 Aside from the subnotebook, one receives the appropriate AC Adapter, a quick-start guide, various handbooks and a 6-cell battery, which is only able to be removed from the notebook by using a rotating mechanism. Sony-branded accessories for the CW-Series are numerous. 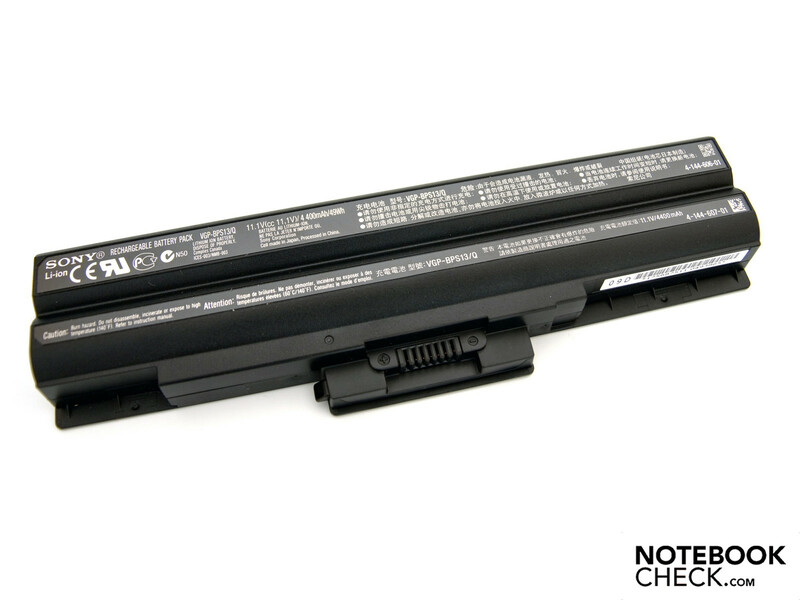 Apart from cases (49-190 Euro) there are a keyboard (99 Euro), mice (26-90 Euro), extended warranties (1 or 2 years, 100 - 236 Euro) as well as power supplies and batteries (130 - 250 Euro). Accessories are relatively expensive and a look to third-party offerings would save some money. 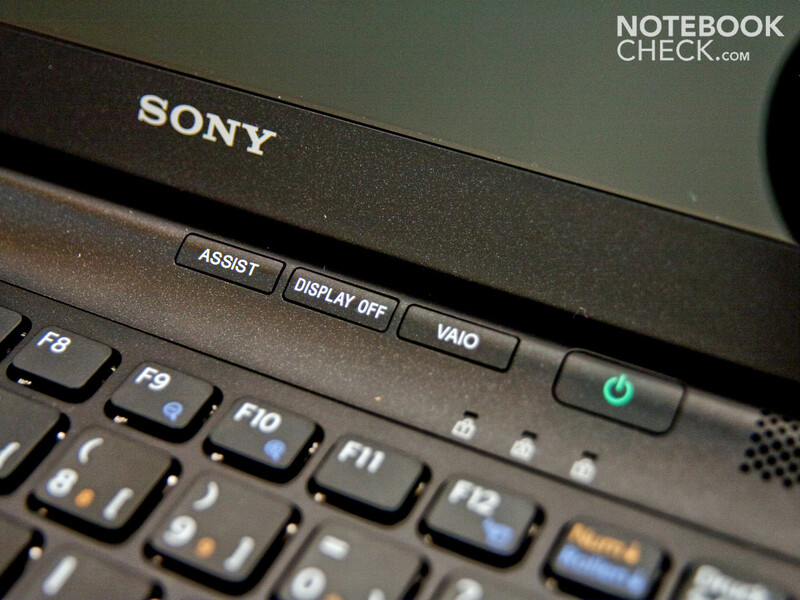 Flipping open the Vaio reveals a simple, single-key keyboard (chiclet-keyed) in the standard keyboard layout. Due to the sufficient 16x16 millimeter sizing and the spacing of the keys, one can touch type without needing extended time to get used to the keyboard. 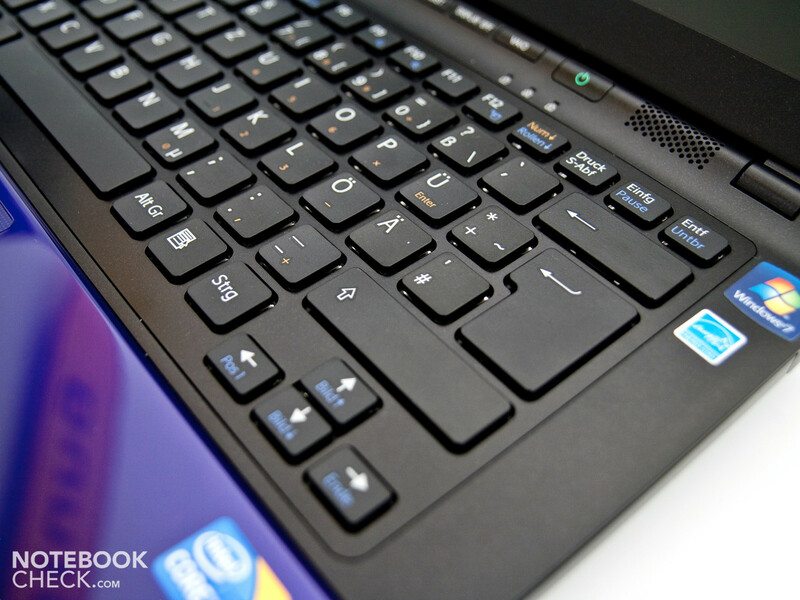 The feedback of the keys is good and the travel and pressure point is comfortable. The increased clattering of the keys stays within acceptable boundaries. 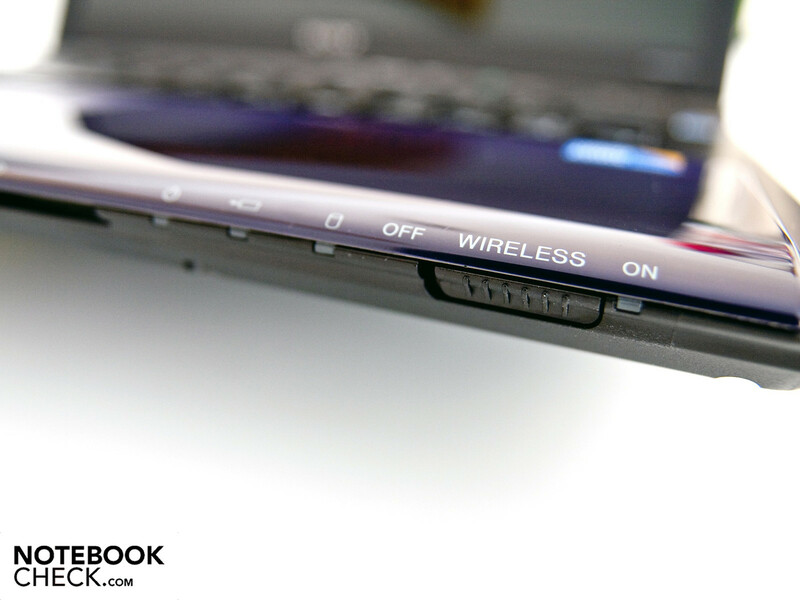 The installed touch pad, sophisticated with its blue palm rests and recessed design, features a slightly roughened surface. The tracking is good and precision navigation is entirely possible. 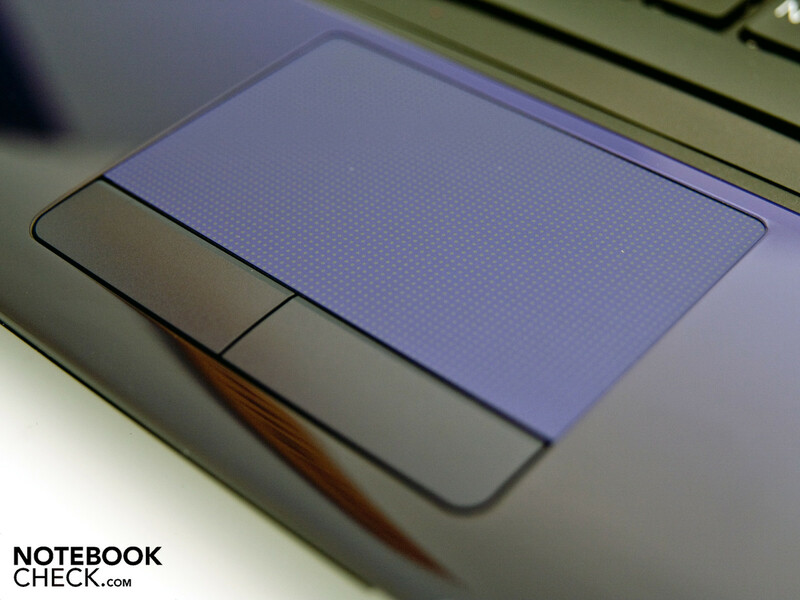 The touch pad does not offer a separate scrolling area, as various multi-touch-gestures are featured. With two fingers one can scroll, zoom, and rotate pictures or windows. The mouse buttons have a good pressure point and work quietly. 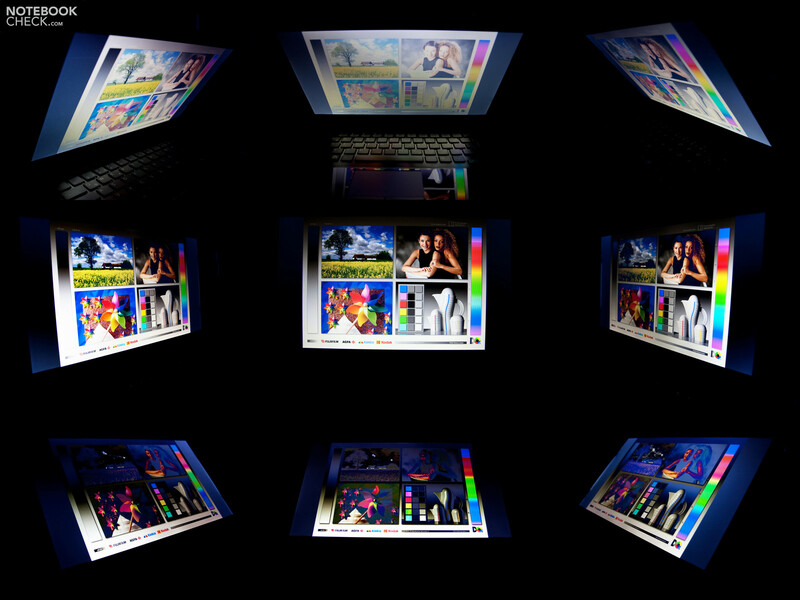 As basic equipment Sony uses a 14-inch HD display with LED-backlighting. The panel is not matte (glossy finish) and has a native resolution of 1366 x 768 pixels in 16:9 format. 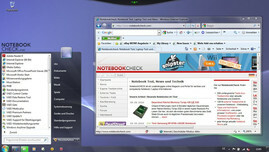 The 16:9 format lends itself well to horizontally oriented applications, such as playing movies. An interesting option from Sony is the high-resolution display with a native resolution of 1600 x 900 pixels. This high-resolution upgrade will tack on an extra 110 Euros to the price. We determined that all the values for the HD-Display lie well inside of acceptable boundaries. Display brightness measured an average 209.4 cd/m², though we measured a maximum of 221 cd/m² in the lower part of the display. The illumination of around 90% is also a positive value. The contrast that we achieved, 175:1 is not very impressive, as the display's black levels were too high. A side effect of the high values is the poor black reproduction. A deep black looks rather gray. The color reproduction and sharpness are excellent and leave room for little criticism. The viewing angle stability is amazingly good. In the horizontal areas, the color reproduction (also at low viewing angles) is stable and the picture is easily recognizable. 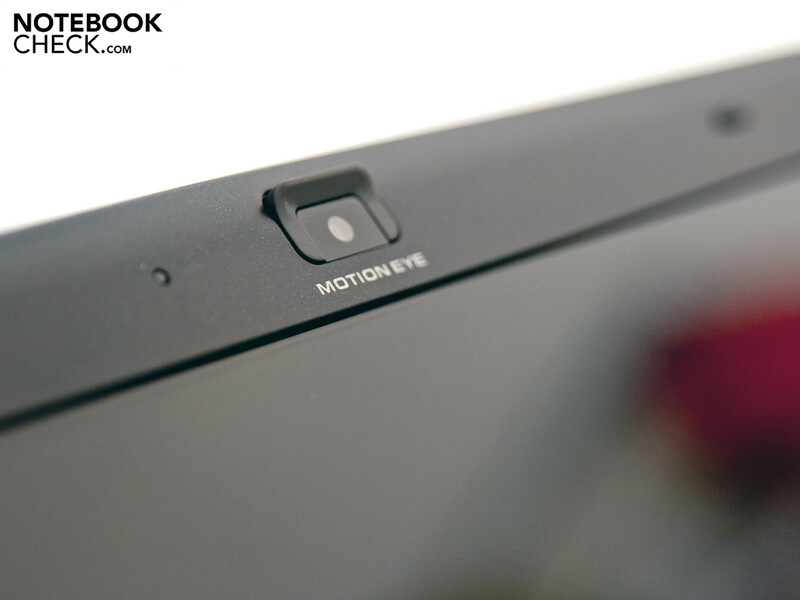 However, in the vertical areas the display has a more limited field of view. With a deviation of as little as 25 to 30 degrees the colors become false and the picture becomes difficult to recognize. 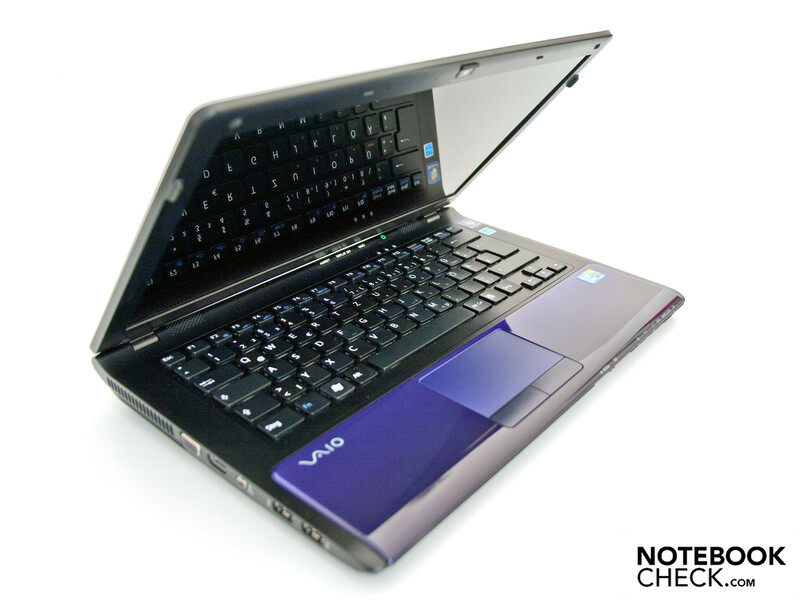 The hardware features conform to those expected of a grown-up 15.6 inch multimedia notebook. 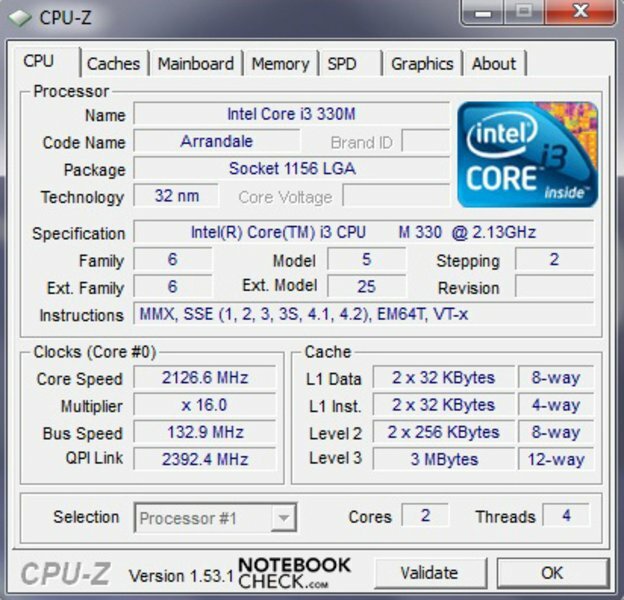 On processor duty is an Intel Core i3-330M with a clock frequency of 2.13 GHz. This processor supports Hyper Threading Technology from Intel, which can simulate two additional processor cores. The maximum energy consumption (TDP) lies at 35 watts. 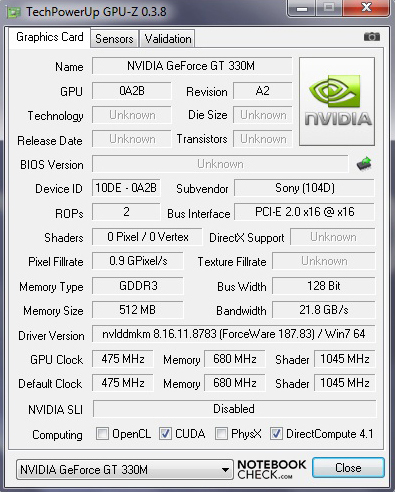 Sony deactivated the integrated Intel GMA HD graphics chipset and in its place beats the heart of a dedicated Nvidia GeForce GT 330M. This chipset, thanks to its fast and ample DDR3 memory, offers up great performance. 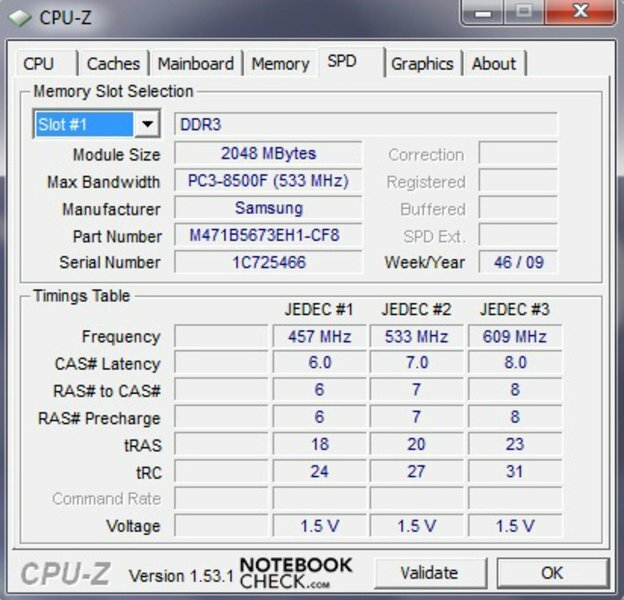 Apart from the processor and the graphics chipset is 4GB of DDR3-8500 RAM (1066 MHz) from Samsung, which is able to be fully utilized thanks to the 64-bit operating system. In all, great performance in Office and multimedia applications is to be expected. In order to compare the performance of our test notebook, we have put the Sony VAIO CW2S1E/L through various benchmarks. 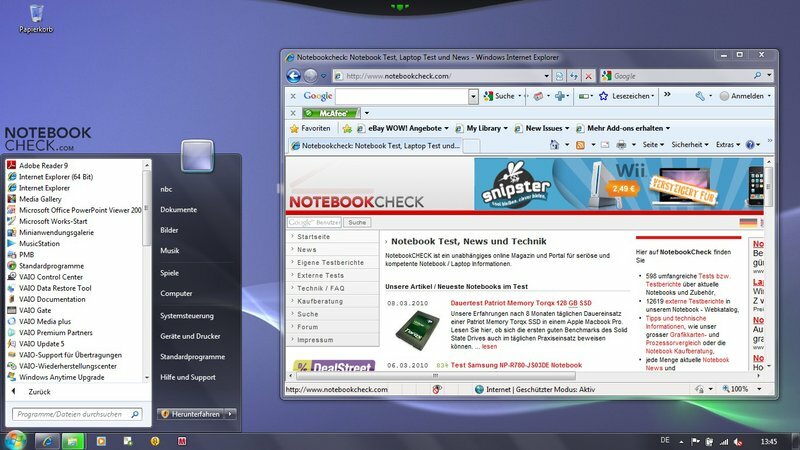 During these tests, the Windows 7 high-performance profile was activated and the power-saving mode was deactivated. The application benchmarks attest to good results. In CineBench R10 (64-bit) 2819 points in single-core and 6578 in multi-core could be achieved. In multi-core rendering, the advantages of Hyper Threading were clearly measurable. 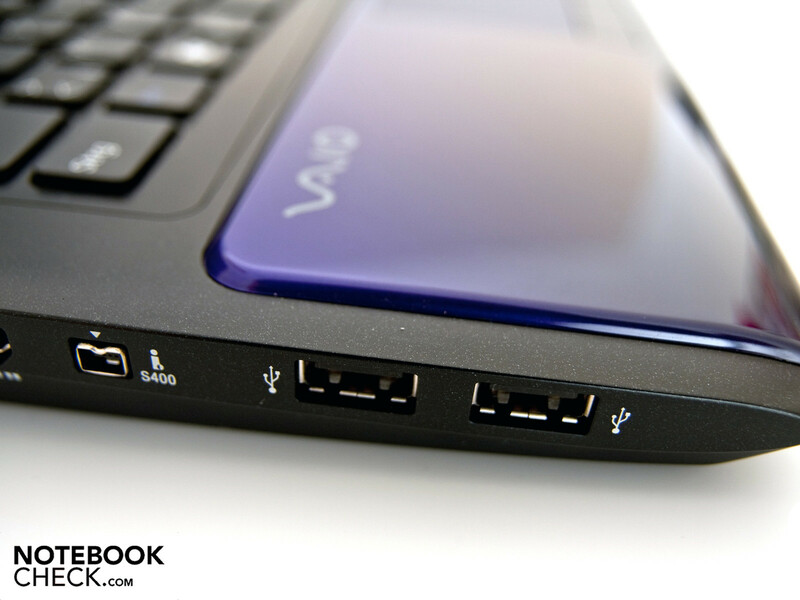 In PCMark Vantage the Vaio achieved a solid 5034 points. 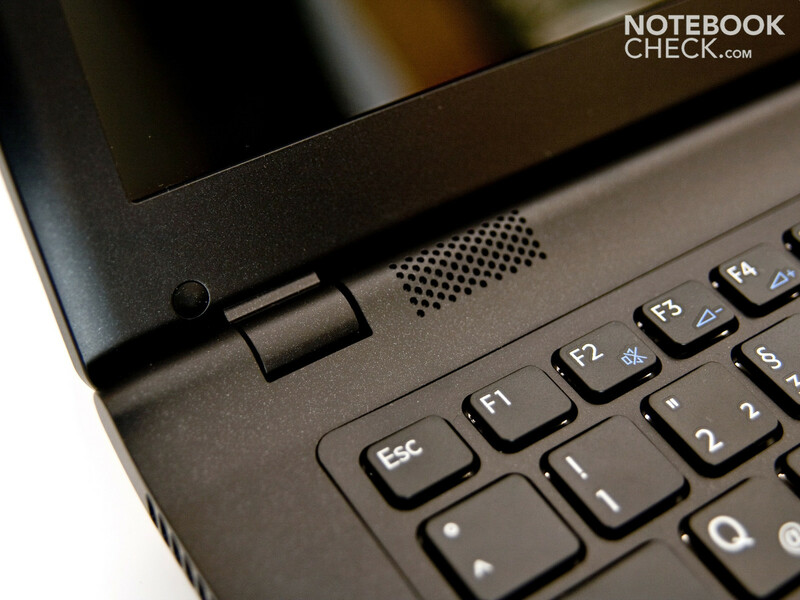 Also in this performance territory are devices with Intel Core i7-720QM processors and ATI Mobility Radeon HD 4670 graphics chipsets, such as the Dell Studio 1747 notebook. Our test machine achieved good, but not excellent values in the synthetic benchmarks. In 3DMark06 (1280 x 1024 pixels) it got 5382 points, where the processor itself scored 2219 points. For all this, in the newer 3DMark Vantage, 2192 points were able to be had. 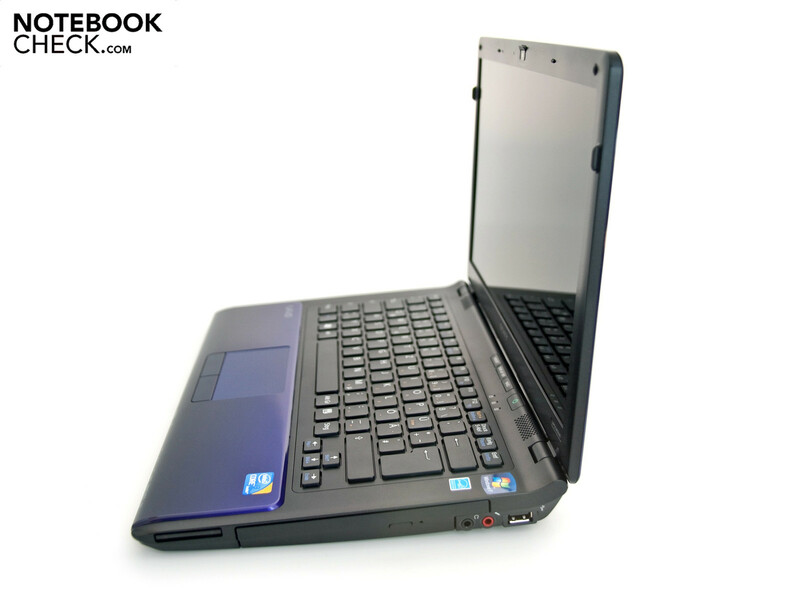 Comparable here are also devices with ATI Mobility Radeon 4650 graphics and Intel processors. Altogether, the new CW-Series from Sony is well suited to gaming. However, it is imperative here that the details and resolution are set to medium, so as to achieve a fluid and playable experience. As a storage medium, the Hitachi HTS545032B9S is in service, with a capacity of 320GB and a speed of 5400 revolutions per minute. The values here turned out about average. The maximum transfer rate was 79.4 MB per second. For a clear improvement in performance, a SSD (Solid State Drive) would be a smart choice, but as of this moment, prices are still hovering around 2.4 Euro per GB. For DVD playback, an Optiarc Multi-DVD drive (DVD/RW AD-7700S) is at work, which supports the entire array of optical DVD formats. For playback of high-resolution films, Sony offers a Blu-Ray drive for an additional 50 Euro and a Burner for an additional 100 Euro. 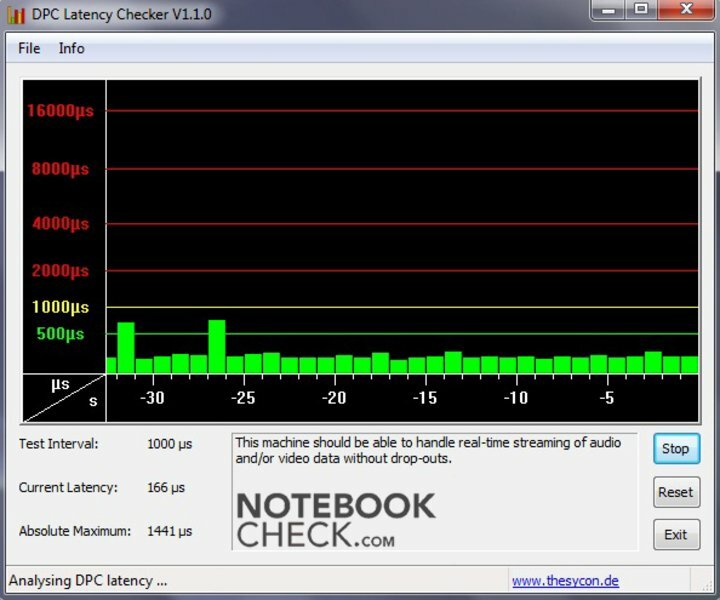 The last test encompassed Latencies in Windows 7. If these latencies lie outside of the critical boundaries, it can lead to problems with external devices. A well-known problem with sound inconsistencies has been reported when using external sound cards. The values for our test system stayed within acceptable boundaries and there were never problems with signal transmission. On the inside, a small quiet fan cools the installed hardware. During normal operation (Office) the CW operated very discreetly with 30.6 - 31.7 dB (A) of noise, which is seldom noticed. 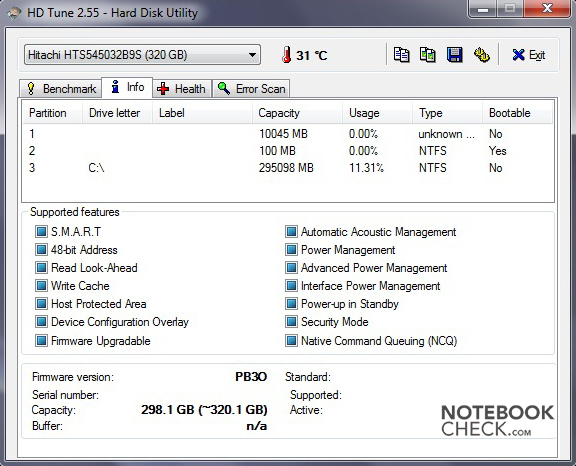 The 320GB hard drive generates 31.7 dB (A). Under stress, the noise generated increases to 36.8-42.2 dB(A) and becomes noticeable. As these highs only become evident for a short time, it is not necessary to criticize these values any further. 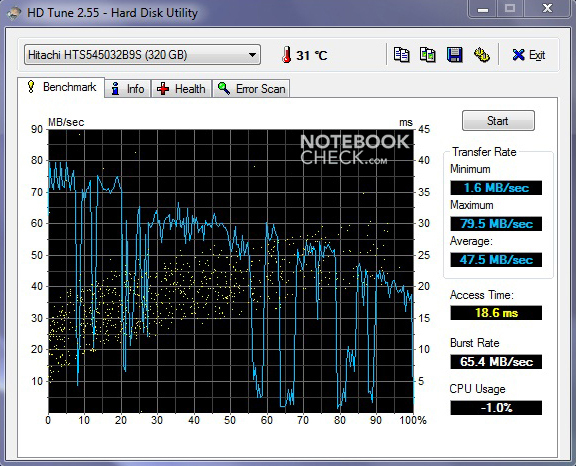 Our test device stayed largely comfortable and cool at idle as well as when under high load. The maximum temperature of 46.6 degrees Celsius was measured under load at the rear of the device, where the cooling fan vents the case. Other values during idle and stress operation stay normal and operating the device on your lap is therefore possible. The loudspeakers of the CW-Series are unable to distance themselves from other speakers in comparable notebooks: sound replay is lacking bass, tinny, and reproduces only higher frequencies. For a multimedia device, we would have expected a robust sound system. 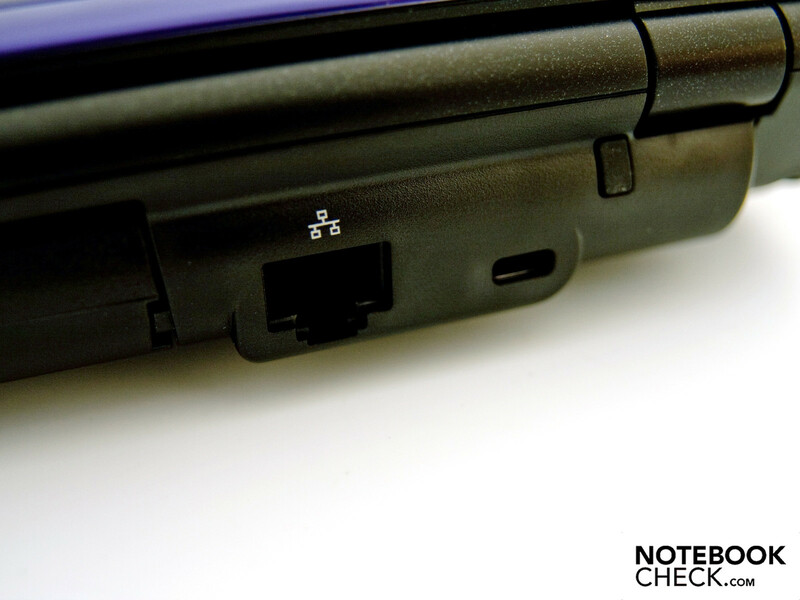 For improved sound quality, the use of external speakers over the 3.5mm headphone jack or HDMI-out is recommended. The included 6-cell battery, offering a capacity of 49Wh, achieves close to the 5-hour run time promised by Sony when running on the included hardware. This 5-hour measurement is measured with display brightness set to minimum, WLAN deactivated and the energy-saving profile activated. The reader's test from Battery Eater ascertained the maximum battery runtime with the settings as described above. After a good 4 hours and 56 minutes the battery was empty and the device was no longer able to be turned on. On the other side of the coin, the minimum battery runtime under stress, measured by the Battery Eater Classic Test, was an acceptable 2 hours and 8 minutes. This was with WLAN on, screen brightness set to max and the high-performance power profile set to on. With just WLAN use and a medium display brightness, we achieved 3 hours and 17 minutes without needing to plug the device back in. It is possible to watch an entire DVD and still have a little bit of battery life left over: after 2 hours and 49 minutes of watching a film, the battery was empty and it was necessary to find an outlet. 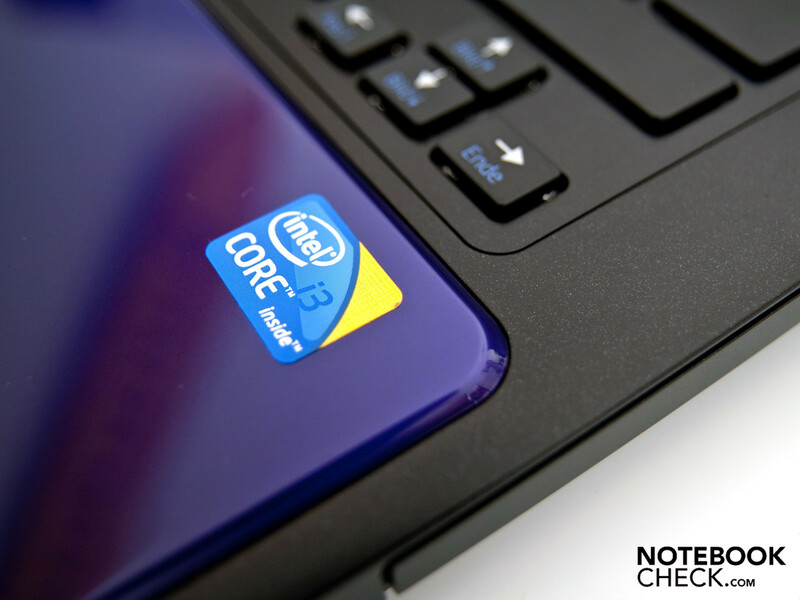 The standard Intel Core i3-330M and the Nvidia GT 330M graphics are not exactly geared for energy-efficient computing. 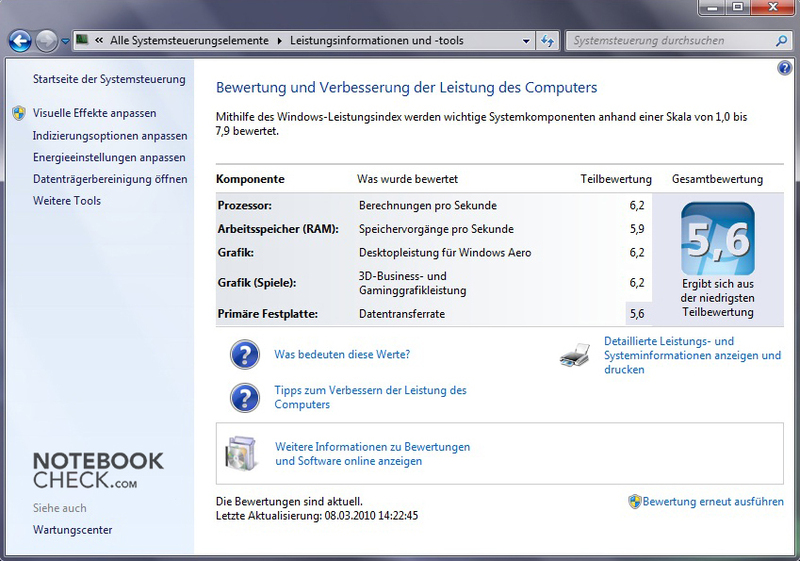 However, the energy consumption lies within the boundaries for a multimedia notebook with this hardware configuration. During normal use, the Vaio used between 17.7 and 18.2 watts of power. Under stress the energy consumption increased greatly to a maximum of 72.2 watts. While turned off, our test device consumed 0.7 watts of power. Even 2.7 watts of power were necessary to keep the device in standby mode! 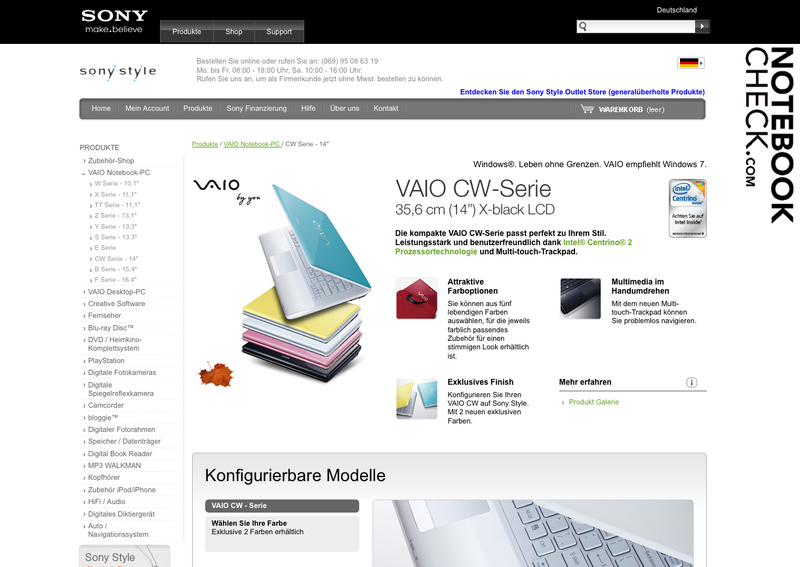 The Sony Vaio VPC-CW2S1E/L left, all told, a good impression upon us and was able to convince us for the most part. The design is sophisticated and the seven different color variants make it modern. Craftsmanship is, with exception of the sharp angle on the palm rest, well executed. The variety of ports is excellent and in this respect it leaves little to be desired. A large advantage is the numerous configuration options that Sony offers for the CW-Series. 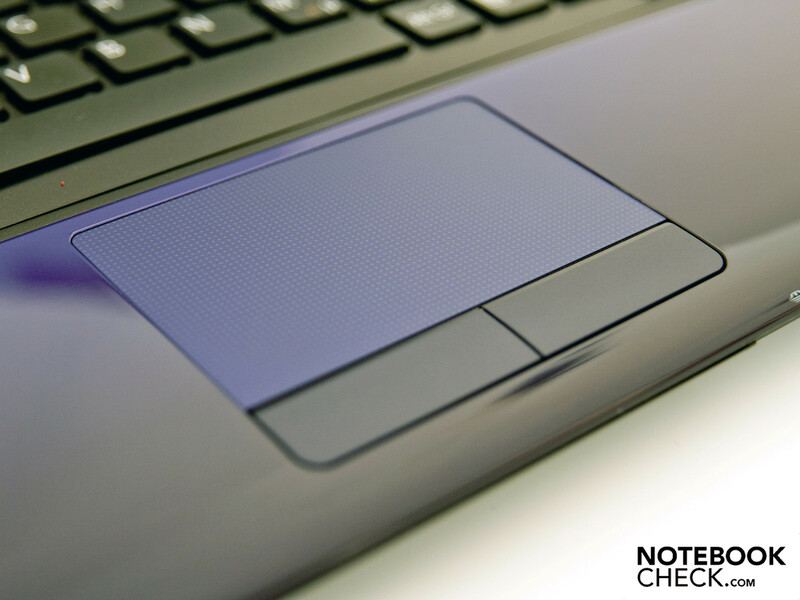 The Chiclet-Keyboard and default touchpad are also worth mentioning. The display offered good values, though the black levels and thus the contrast were only satisfactory. An interesting alternative from Sony is the display with a resolution of 1600 x 900 pixels. 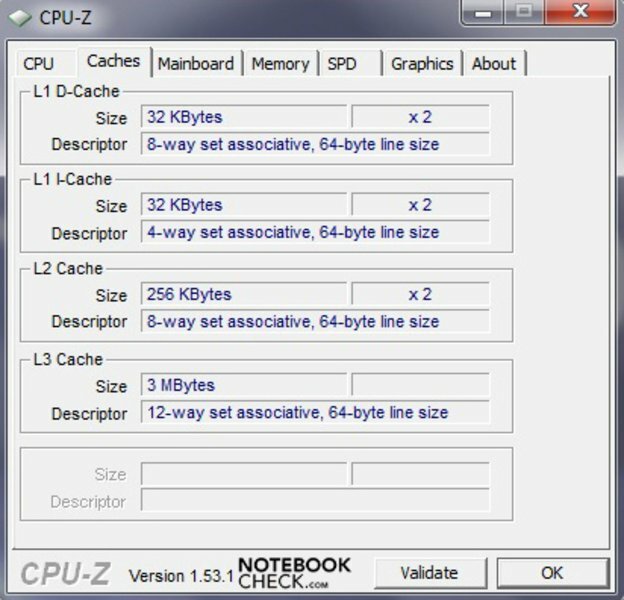 The performance of the hardware is as expected of a multimedia notebook and furthermore games are playable on this series with effects set on medium. 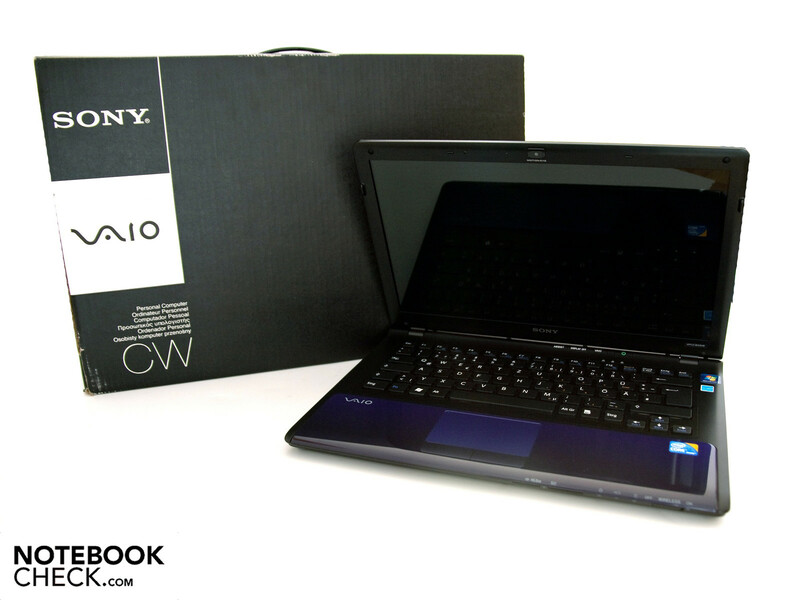 All in all, Sony offers the perfect mix of powerful multimedia notebook and mobile subnotebook with the CW-Series. The standard Core i3-330M and the GT 330M graphics from Nvidia offer solid computing power and the 6-cell battery allows a battery runtime of about 5 hours. The poor loudspeakers and limited package contents aside, the CW-Series from Sony is not a bad choice at all when looking for a compromise between power and runtime. Our test machine (VPC-CW2S1E/L) costs 829 Euro (MSRP) equipped as standard. Above this, Sony offers several possibilities in both hard- and software components. 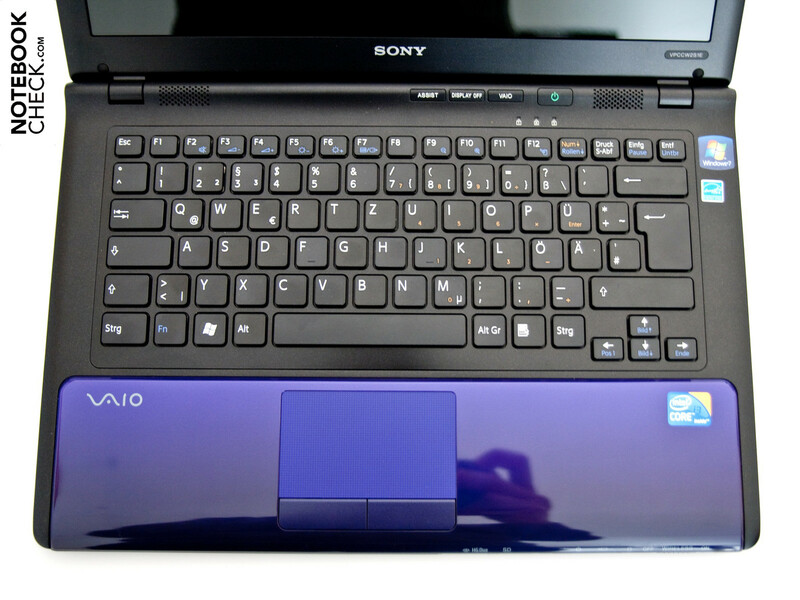 The modern design, the various opportunities for configuration, the good display, comfortable Chiclet-Keyboard, good computing performance in multimedia applications, great connectivity and starting price. The performance of the system and the poor craftsmanship of the palm rest, unusual for systems from Sony. 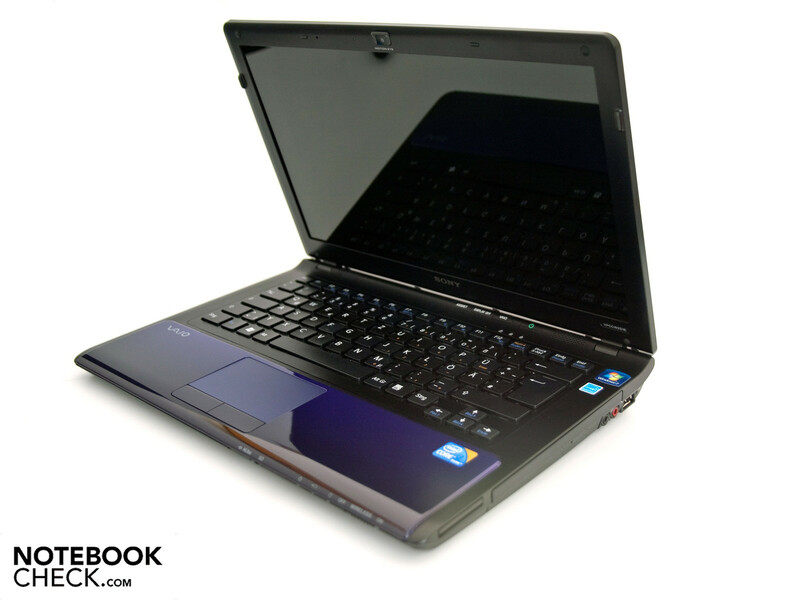 Current (Sub-)Notebooks with Intel Core iX processor and dedicated Nvidia or ATI graphics cards. 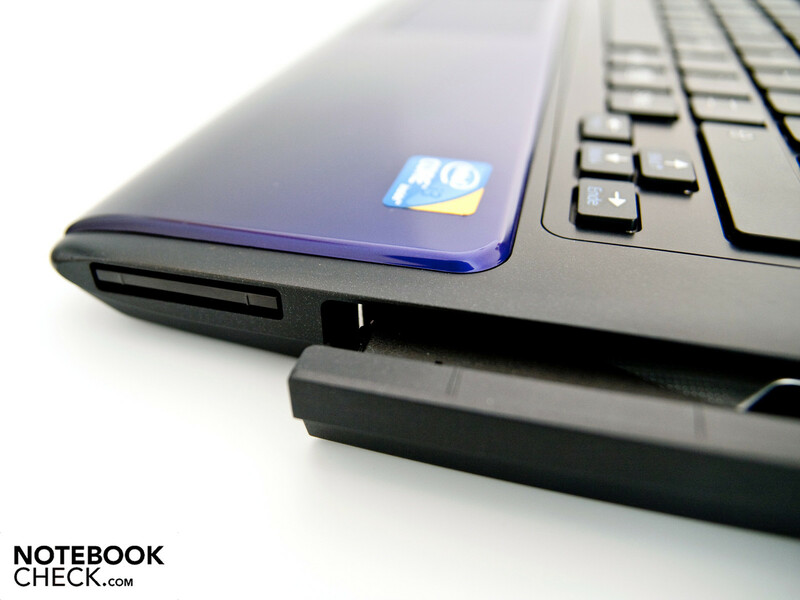 Among others, the powerful Packard Bell Easynote TJ-75, the HP Pavillion dv4-2155dx Subnotebook, the Samsung R480 Notebook and the Toshiba Satellite E205.